A portion of my work is focused on facilitating group therapy. I lead process oriented or long term groups, and I am a Certified Group Psychotherapist (CGP) through the American Group and Psychotherapy Association. Therapeutic groups provide opportunity to create powerful healing experiences for people. 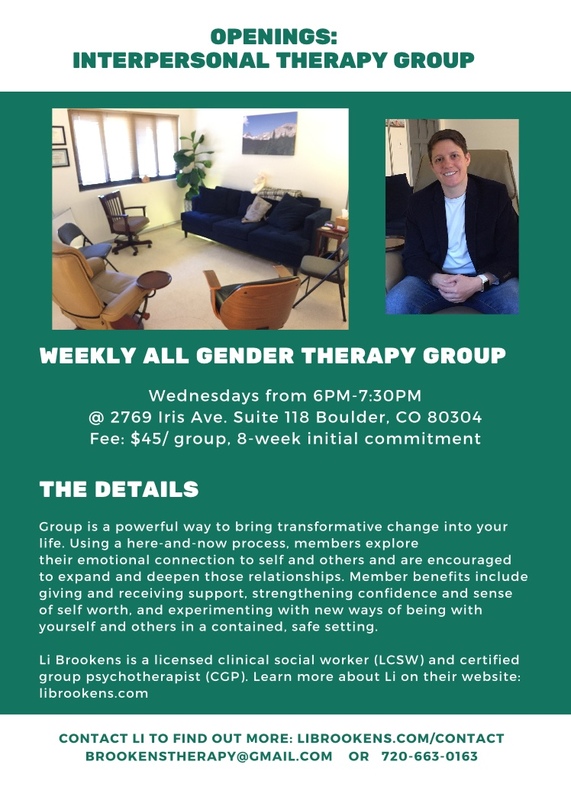 Ongoing therapy group in Boulder organized around here-and-now group processing. Designed for adults who are interested in exploring relationships in a group setting. You can expect to receive support and feedback regarding your emotional and interpersonal struggles. The group will help you to build awareness, improve your relationships, and change or manage unhealthy behaviors in a supportive setting.